Today I was planning to head over to Atlantic City to walk on the 6 mile boardwalk. 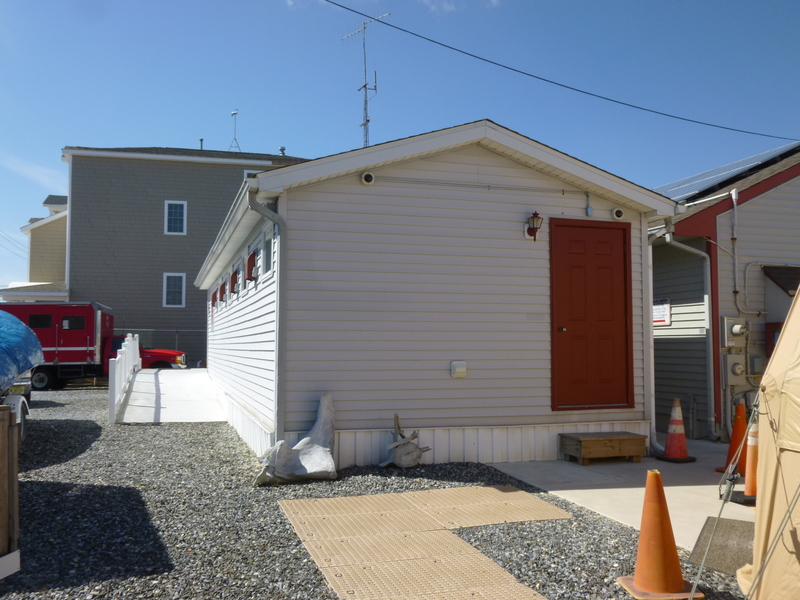 I had called an information hotline to make sure it was still there after Hurricane Sandy, and the lady told me it was open. But first I had a couple stops to make, and it turned into a 2 donation day. 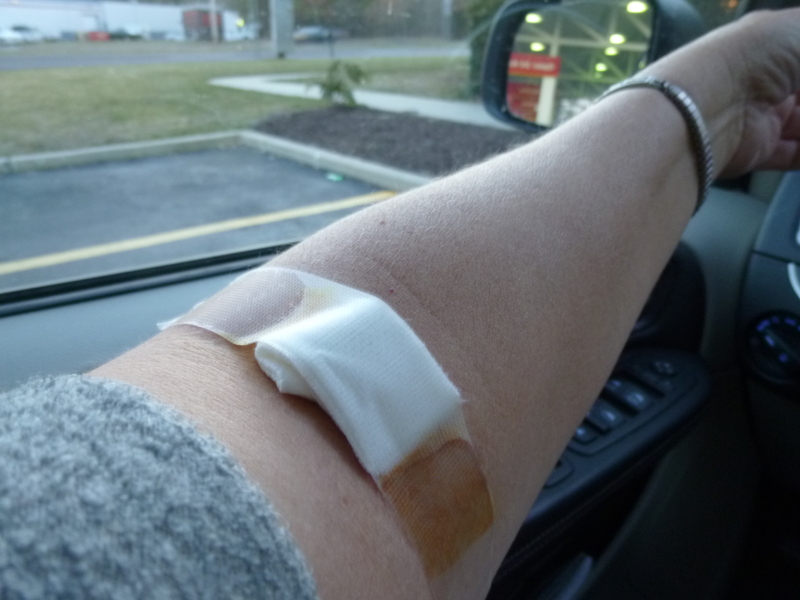 My first donation today went to the Red Cross – in blood! I donated a pint of blood today, which I’ve done many times in the past. I think I’ve donated 14-15 pints of blood. Somebody from the Red Cross literally calls me every 56 days (and that’s a coincidence!) to schedule another appointment, but last spring I had been in a part of Mexico that had a malaria risk, so I was ineligible to donate blood for a year. When the year was up, to the day, the Red Cross called to see if they could schedule an appointment for me to donate blood again. And that was last week sometime. I explained I was on the road, and would have to find a donor center that was open when I was passing through, so I didn’t schedule anything right then. Yesterday in Cape May I passed a high school that had a sign out front about a blood drive, and since I was nearly done with my walking, I stopped by. 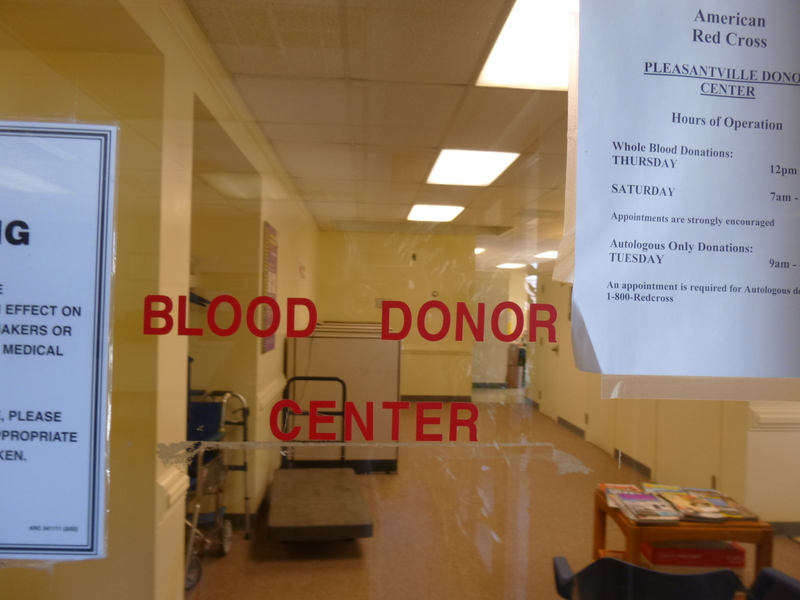 But it turned out the blood drive had been yesterday and they forgot to take the sign down. 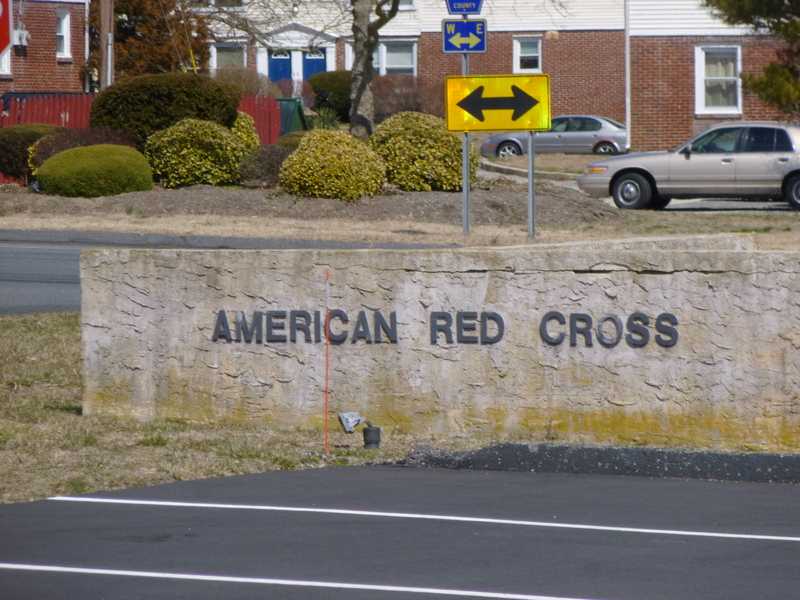 But it inspired me to call the Red Cross, and they figured out that there was a Red Cross donor site in Pleasantville, New Jersey that was open on Saturdays and I had to drive right through Pleasantville on my way to Atlantic City, so I scheduled an appointment. And all went well, as usual. Knock on wood, I have never had any side effects or dizziness after donating blood, and I find it an easy thing to do, and I have good veins for it. As long as I get 2 cans of OJ and some cookies afterward, I’m good to go! Once I was done with that, I called in to the radio station where they were doing the “Celebrating our Veterans” show and talked with Derick from the veteran’s home. He was happy I called in, and asked me to explain my journey and he had some questions. I think it was all on the radio, but to me, it just seemed like I was having a phone conversation. He asked if I could call back every now and then to keep them updated on where I am on my journey. 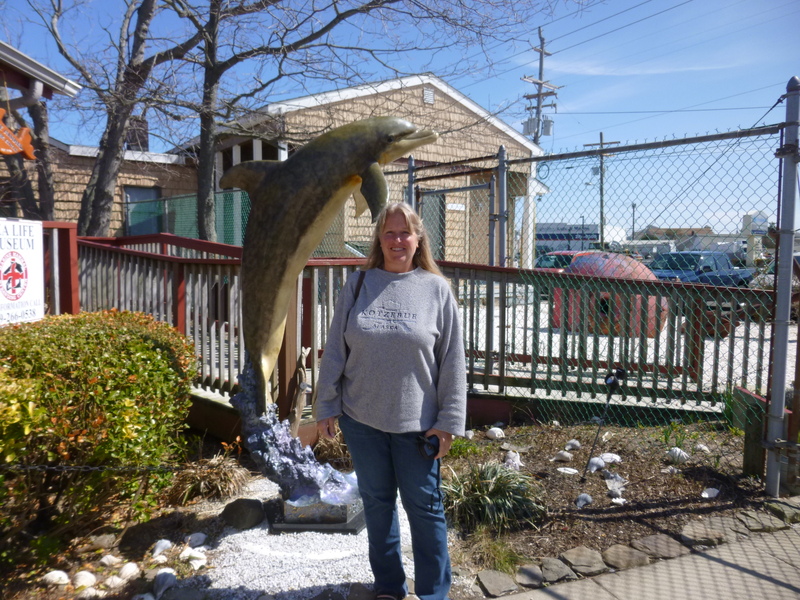 And then I had to get going to the Marine Mammal Stranding Center in Brigantine before they closed. Brigantine is north of Atlantic City on an island, and I had to drive through the city to get to the bridge. I found Atlantic City to be crowded, gaudy and seedy – maybe I just wasn’t in the mood for dealing with crowded streets and traffic lights that weren’t in synch at all, and streets blocked by police, and I got a little turned around getting to the bridge, and I was happy to get over to the island! 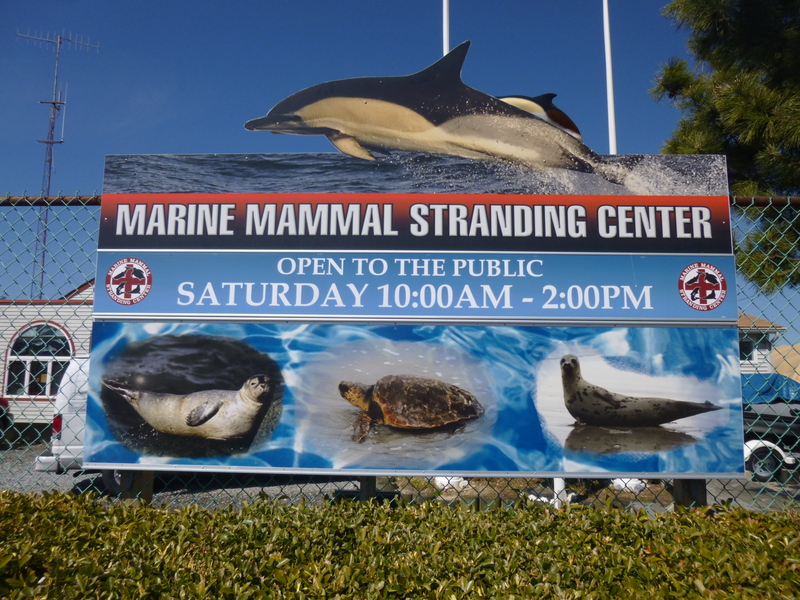 I hadn’t made an animal-related donation for a while, and when I read about the Marine Mammal Stranding Center, I thought that would be a fun place to visit, and they were only open for visitors on Saturdays til 2. I almost didn’t get there in time with all the traffic and blocked off streets in Atlantic City. But they were still happy to tell me about the center and they let me watch their video while they were closing up. 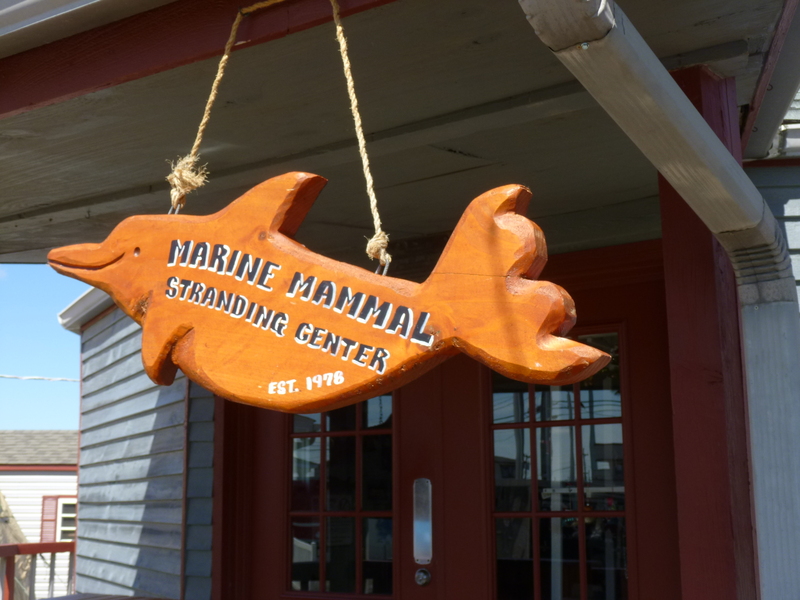 The Marine Mammal Stranding Center is the only one of its kind in New Jersey, and they can accommodate quite a few injured and malnourished critters. 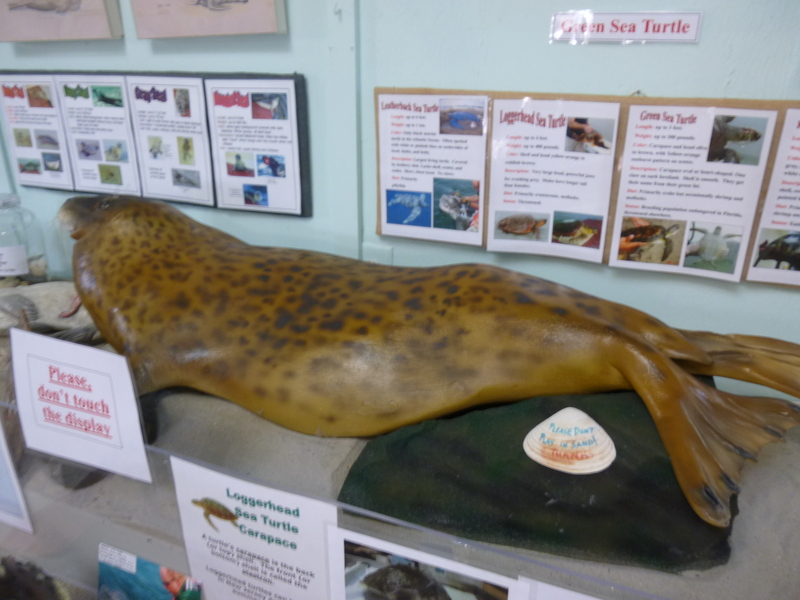 They deal with a lot of seals, and some dolphins, and have even taken in a couple small whales in the past. 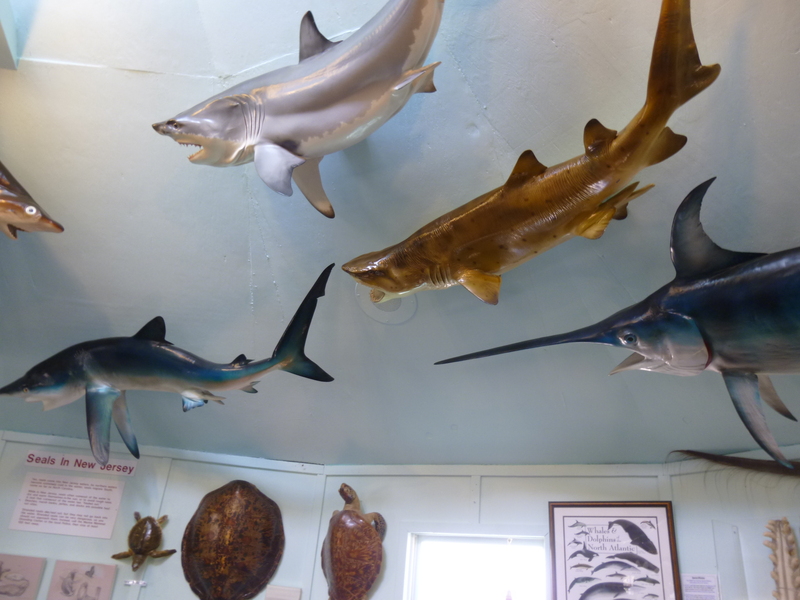 And in August they often get sea turtles in, even though turtles don’t make their nests on the Jersey coast. There are literally hundreds of volunteers to help the 7-8 people on staff, and they take in animals from other states when necessary. There’s ICU tanks in a pole barn, and because they had animals in there, we couldn’t couldn’t go in to look around. They also have an overflow tent with more tanks for when they get full. As I was making my donation, another baby seal was brought in. The center has a couple red trucks that sort of look like a big ambulance to go out on the rescue runs. Once the animals have recovered from whatever is ailing them, they are released back into the ocean. 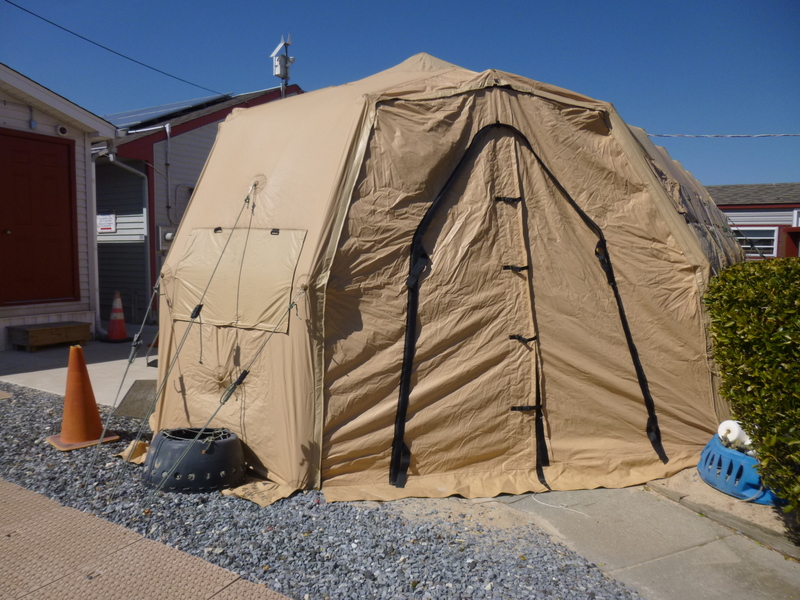 They suffered hurricane damage – the museum was secure (there are fiberglass models of all the sea life in the waters around New Jersey), but the overflow tent had to be replaced and some of their equipment had major damage from all the salt spray. But with the help of their volunteers they got things cleaned up quickly. I’m glad I was able to get there, and they were happy to be included in my journey. So that was donation #2 for the day. From there Tula and I went to the end of the island where there was a big beach and a short concrete promenade, and we got a mile and a half of walking in. 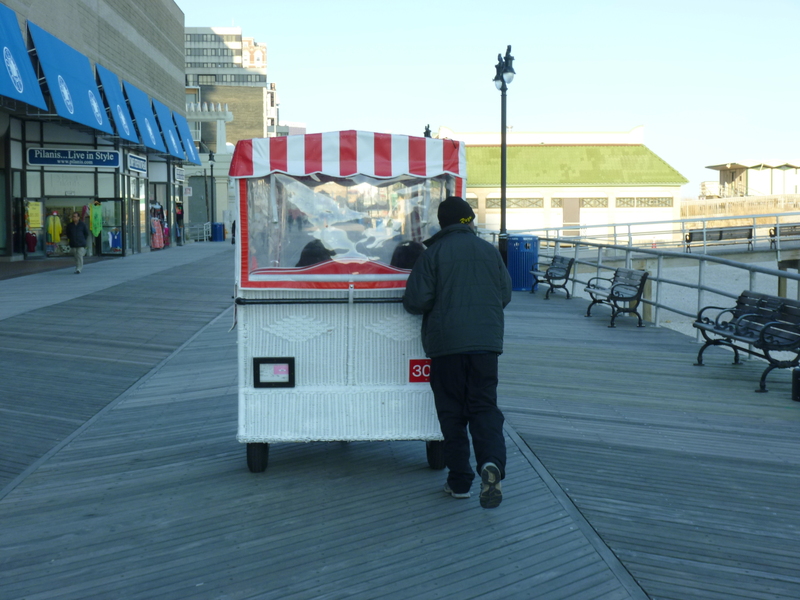 Then I was ready to brave the traffic and head back into Atlantic City so I could walk on the boardwalk. I puzzled over where to park for a while – I didn’t want to walk through town and I didn’t really want to park on the street – I was just feeling some bad vibes. 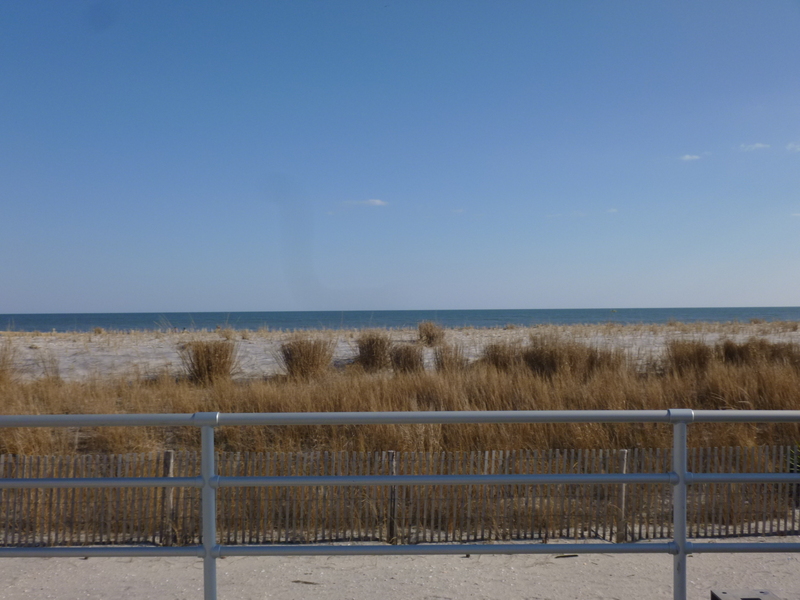 So I drove around a bit, and found a small guarded parking lot right by the boardwalk, and was happy to pay the $5 fee to park safely for a few hours. 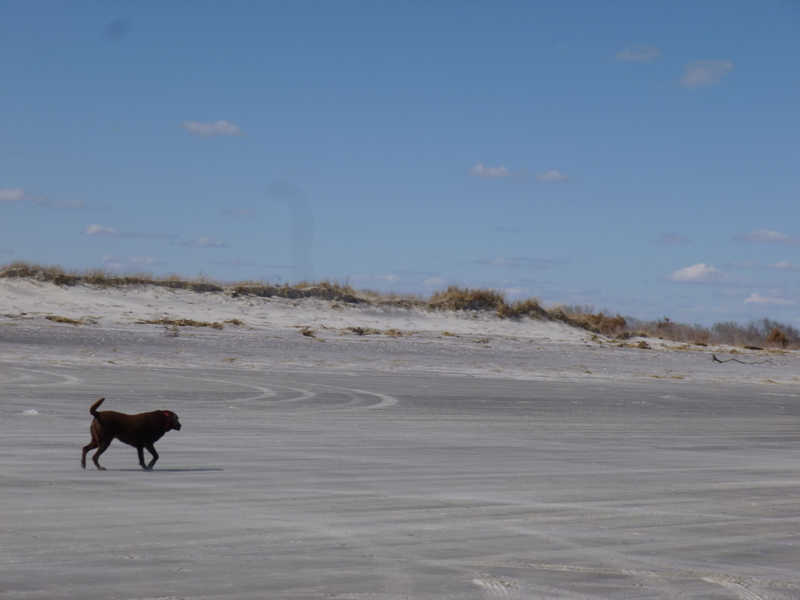 And then Tula and I set off. 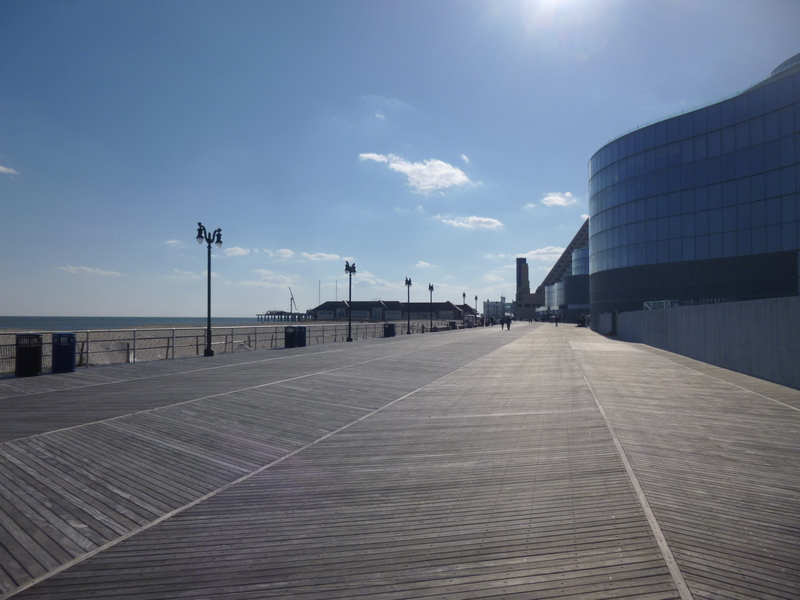 Atlantic City has a 6 mile boardwalk, which would be 12 miles if I walked the whole way down and back. 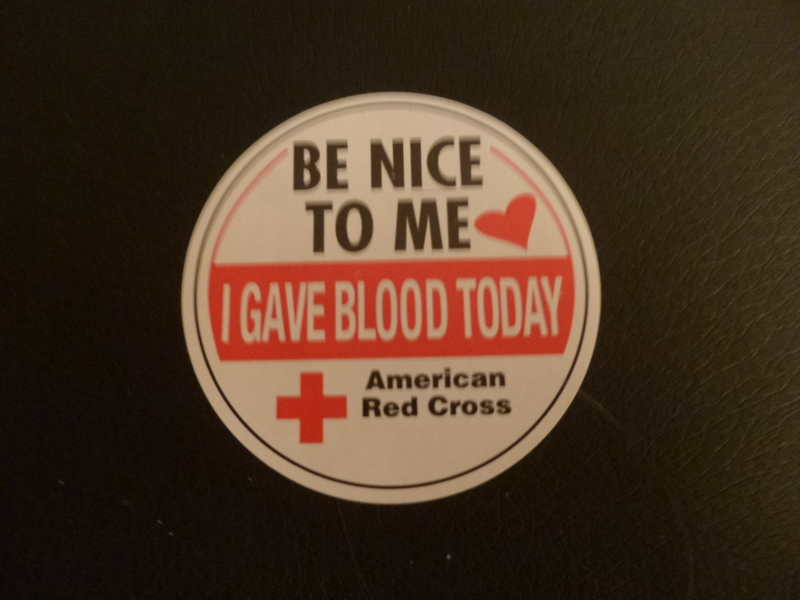 But I didn’t do that – I was mindful of having donated blood and even though I felt fine, I made myself sit down to rest every couple of miles, and I had a bunch of water. Dogs aren’t allowed on the boardwalk during the busy summer months so I was glad to be there when I was. We walked 7 miles altogether, and it was pretty crowded in the casino area since it was a Saturday. 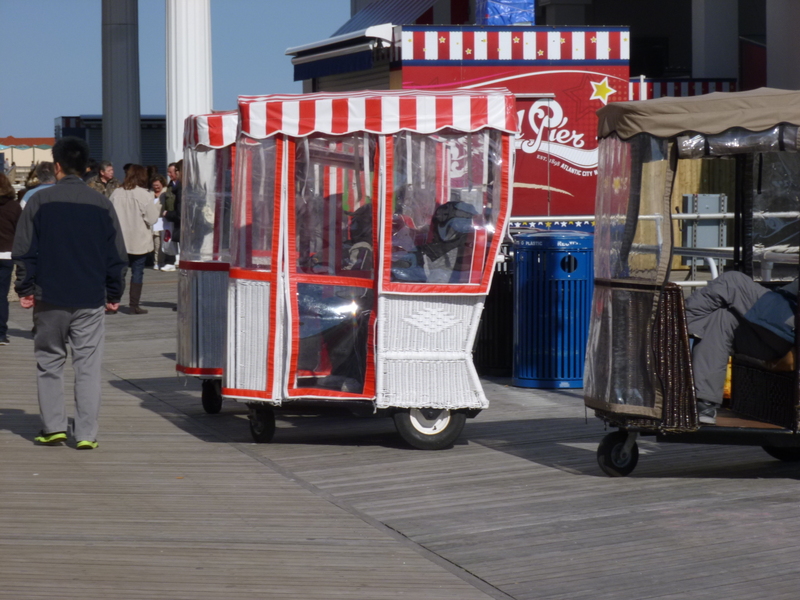 For people who wanted to get from one casino to another without walking, there were a bunch of “rolling chairs” available for hire, and then someone would push it as far as they wanted to go – kind of like adult-sized strollers that can hold 2 people! And there were lots of people enjoying the service! I guess if I was wearing heels (ha!) I wouldn’t want to walk on a boardwalk either! Even if I had all day, I wouldn’t have walked the whole boardwalk. 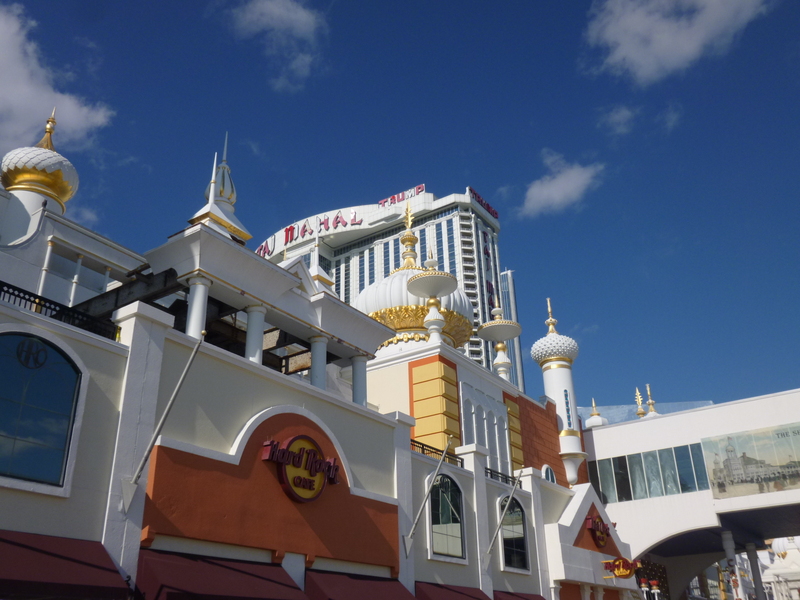 What surprised me was how quickly the surroundings changed from the glitz and commotion of the whole casino/hotel part of the boardwalk to an area that seemed a little run down. 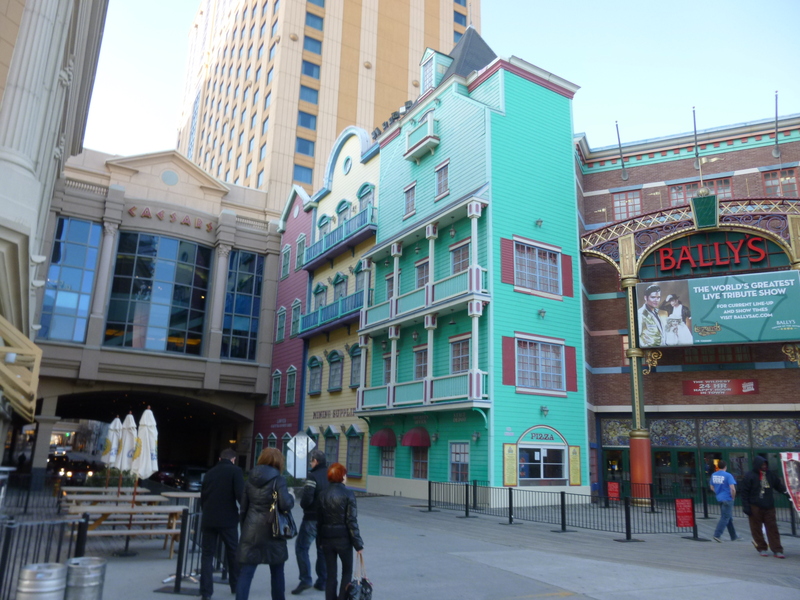 Once I had walked past the last hotel on the gambling strip, the whole character of the boardwalk changed – hardly anyone was around, some buildings appeared abandoned, and it didn’t seem like a great area, so I turned around. 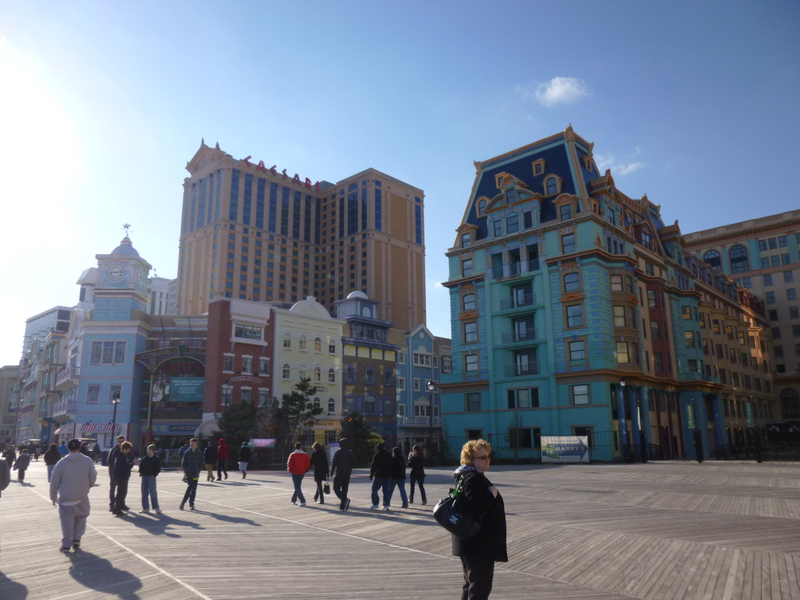 Luckily the casino/hotel area took up a long stretch of the boardwalk so I could walk as many miles as I did. By this time it was beginning to get dark and I had walked 8 1/2 miles, so it was time to head back to the motel. I had actually kept a centrally located motel for several nights since it was one of the very few reasonably priced pet-friendly motels in the whole area. 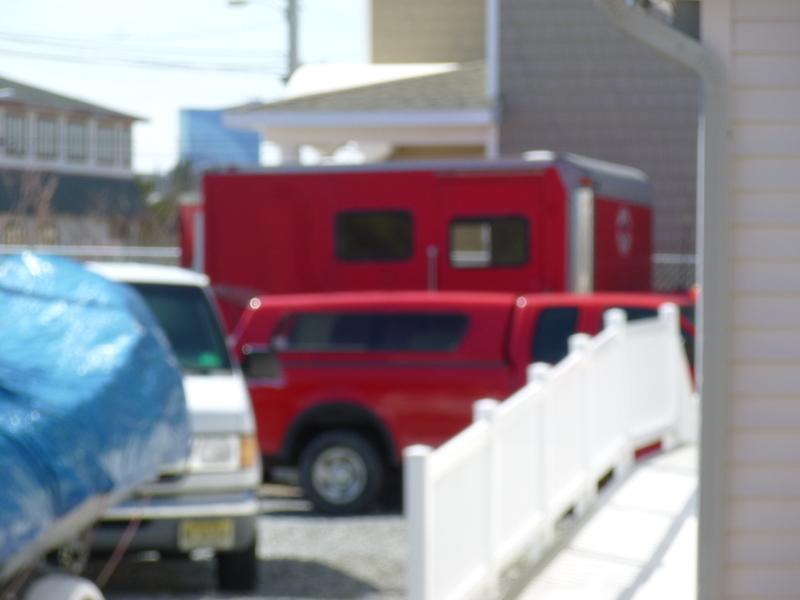 None of the motels in and near Atlantic City allow pets – and although I had called several of them just outside of town, I was happy I didn’t end up staying there once I saw them. Overall, so far, I think I’m surprised I haven’t seen more hurricane damage along the coast. Other than part of the boardwalk in Ocean City Maryland being replaced, and the occasional sight of a boarded up window here, or a pile of debris there, things don’t seem too bad considering how big the hurricane was, and how much damage it caused. I know people have been working hard to get things back in shape for the relatively short tourist season, and I probably haven’t been to the hardest-hit places.